This exhibition is a rare chance to see the work of social documentary photographer Shirley Baker, and a portrait of the urban decline of late twentieth century Britain. 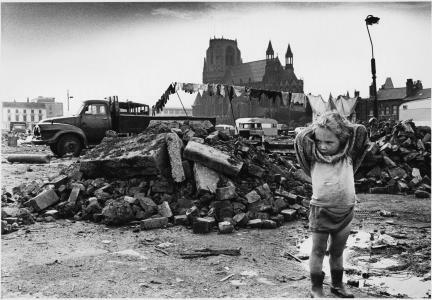 It focuses on Baker’s depictions of the urban clearance programmes of inner-city Manchester and Salford during 1961 – 1981 and the work documents what Baker saw as the needless destruction of working class communities. Despite being the only woman practicing street photography in Britain at the time, Shirley Baker’s humanist documentary work received little attention throughout her sixty-five year career. She claimed never to have posed her pictures, an action inimical to her documentarist ideals, yet her multi-layered images and exacting compositions imply dwelling on a scene until each element falls into place. Her visual puns, often the result of juxtaposing ‘chance’ elements in her field of vision, result in a humour and everyday surrealism that would have eluded most passers-by. Objects and scenes take on significance beyond their literal appearance. Half demolished walls and peeling wallpaper resound with lives once lived. Her meticulous focus on graffiti brings the plain brickwork to life and generates backdrops for scenarios in which her ordinary subjects, in their functional environments, become momentarily extraordinary. 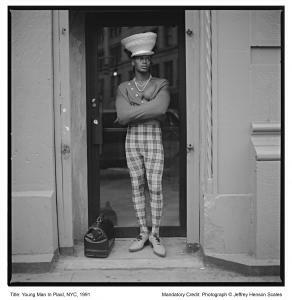 This exhibition includes previously unseen colour photographs by Baker alongside black and white images and ephemera such as magazine spreads, contact sheets and various sketches.